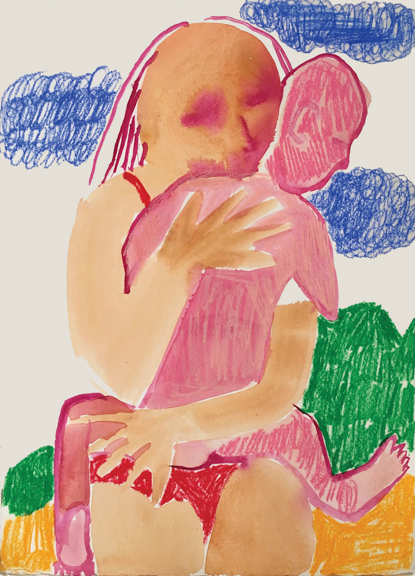 New York based painter Kimia Ferdowsi Kline was born in Nashville, Tennessee in 1984. She earned an M.F.A. in visual arts at the San Francisco Art Institute in 2011 and holds a B.F.A. in painting from Washington University in St. Louis. Most recently she was honored to be awarded the Basil Alkazzi Detroit Residency through the New York Foundation for the Arts. As an extension of her studio practice, Kimia also curates the art collection of Wythe Hotel in Brooklyn, NY. She is represented by Turn Gallery in New York, NY. My work draws on the stories I grew up hearing about my parents’ life in Tehran. Unable to visit or return to Iran due to religious persecution, I've established a connection with this ghost homeland through the process of painting. My paintings are reconstructed experiences based on imagination, invention, and the collective memory of my family. Constructing these images serves as an arena for experience--a way for me to engage in a time and place and with family members I’m otherwise barred from knowing. The process of making these images is a way of repairing a certain sense of cultural amputation from my place of origin, and reclaiming a central element of my identity. Can you tell us a bit about your process? How do you begin and how does the process of making a painting unfold for you? Sometimes a painting will start with a found photo, sometimes it will start from a few lines I drew in my sketchbook 4 years ago, sometimes it will begin with a line of poetry. I have trouble talking about my process because it's all very mysterious to me. Often I'll step back from a painting and not entirely know how I ended up with the image in front of me. Some of your supports are found materials—what is the significance of the found materials for you and from where do you source them? Improvisation is a big factor in my process, and the act of finding material and responding to it is alchemical in nature. It feels like magic that I could find a piece of discarded wood and make it into something beautiful. My studio is in the Brooklyn Navy Yard, and I share a floor with lots of wood workers and furniture designers. The hallway is filled with scraps which I collect and respond to in the studio. The conversation broadens for me when I work this way. Sometimes a piece of wood will have writing on it or a side of it will be painted a dark green or neon orange for some unknown reason. 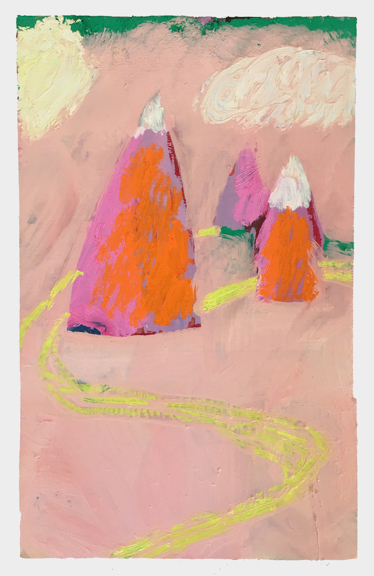 I love that the evidence of another hand is present, and that their experience with this piece of wood is embedded in the final painting and absorbed into my process. The oil stick lends an incredibly tactile element to the surfaces of your paintings. What draws you to working with oil sticks and are there any challenges associated with including it as a material? Holding a pencil or crayon is very different for me than holding a brush, and the lines and marks I can get with an oil stick are more immediate and direct—often more efficient as well. I also love the texture they create. Because the pigment is mixed with wax, the surfaces of my paintings get really thick and start to almost feel like carvings. The challenges for me are the cost and the prolonged drying time. 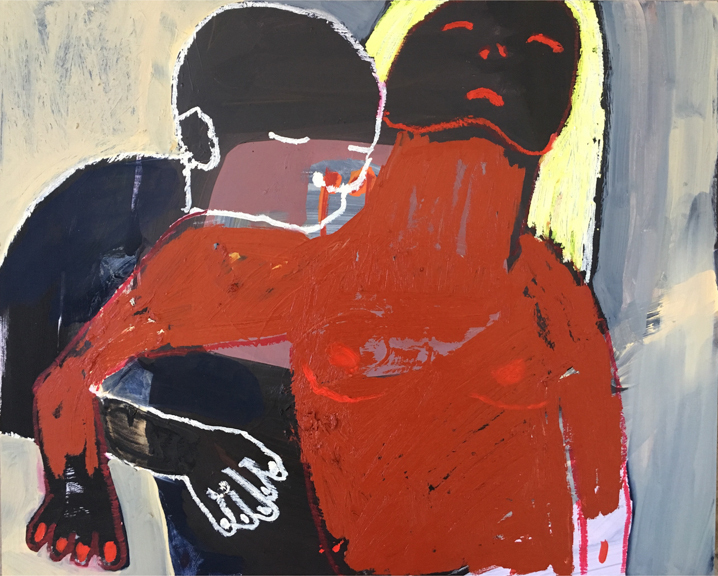 Are there prominent themes or feelings that you hope to convey to the viewer, or things that are weighing on your mind at the moment that might come through the work? I think a lot about the human condition and the universal experiences we share. I am a product of many different cultures, languages, and countries, and I see more similarities than differences across borders. Essentially I think I'm interested in the oneness of humanity and finding ways of portraying this. I'm also interested in the spiritual and divine. What does it mean to be a human and have a soul? I believe that we're more than just material beings and art for me is a medium that's expansive enough to hold and explore these intangible ideas. Can you tell us more about your choices for titles and how titles function for you? Words serve a certain function for us because of their inherent specificity. Images serve a different function because of their inherent poetry and broad room for interpretation. Merging these two languages is an incredibly powerful mode of communication. My titles are just as important as my final paintings—they generally come at the end and mark when the piece is really finished. It reminds me of how we name babies when they're born into this world—very important stuff. I recently moved my studio into the Brooklyn Navy Yard, and this move has been really exciting. Lots more space, proximity to the water, there are other artists around that I bump into and get to have conversations with. It's amazing how much this relocation has positively influenced my creative practice. You curated the group show, SAY YES at the Elaine L. Jacob Gallery at Wayne State University. Can you tell us more about the exhibition and the experience of curating such a big show? This was a really exciting opportunity and challenge for me. I had been thinking a lot about the role of improvisation and play in my own work when I got asked to do the show. My husband did improv comedy in college and explained to me that one of the rules of improv is to "always say yes" and go along with any scenario a fellow actor presents. (I read this same "rule" in Tina Fey's "Bossy Pants" so then I knew it had to be true.) I was thinking about this in relation to how I make art and the importance of learning to "say yes" in my own process, which is how the idea for the show was born. I spent the next 8 months visiting artists who work in this way and regard this notion of "playfulness" as imperative to their creative process. The show includes 22 artists and spans two floors. Envisioning the work of 22 artists in this massive gallery in a different city really tested my imagination and spatial skills! But it somehow ended up all coming together. I think the show is important because it celebrates an intuitive approach to making work, something I don't think we talk enough about in the art world and in art education. You are the Art Curator of Wythe Hotel in Brooklyn. That sounds like a dream job! Can you tell us more about your role there? I curate the permanent collection of artwork in the hotel rooms, which is made up entirely of original artwork by Brooklyn based artists. The Hotel purchases all the work without any intention of reselling it, so we really function like a patron as opposed to a gallery. I also curate the installation space in the lobby, which rotates out quarterly, and I also help with various events and programming like lectures, draw-a-thons, etc. that happen throughout the year. I think what we're doing though is more than just buying art—we are creating spaces to build a community focused on celebrating and fostering creativity. It's a dream job in every sense. How did you become interested in curating? What was your evolution as a curator like? I think painting is about authorship, and curating is about editing. I enjoy both processes immensely and have always been interested in both. My evolution in both roles is still unfolding, but they definitely inform one another. I think curating makes me a better painter, and painting makes me a better curator. How do you discover new artists and stay involved in the art community in New York? Working as a curator keeps me always on the lookout for new artists and exciting collaborations or project opportunities. I discover new artists from fellow artists and friends, I go to art fairs and see shows. Because I'm also a painter this is all really natural for m—it never feels like work because these are the things I would be doing anyway. Any advice for artists who are interested in creating community and finding an audience for their work? Building community takes patience. In an era of microwaves, Seamless, and wifi, we are used to things happening instantly. But building community is an organic process of growth, which takes time. A seed doesn't turn into a tree overnight, and remembering this is important. I think community is really about friendship—it comes naturally when we are genuinely concerned for those around us and formed when we learn how to better serve one another. If artists are interested in creating community, my advice is to find ways of serving other artists. As for finding an audience, I don't think it's useful to worry about it so much. If you're going to worry, then worry about making good work. If the work is good the audience will come. I don't really have typical days because so much of my work is project based—I work more in cycles than in days. At certain points during the year I'll be in studio 60 hours a week painting getting ready for shows. At other points I'll be working on curating a show and will be glued to my computer screen sending emails about shipping and titles and logistics. Sometimes I'll be at a residency in a new city with little responsibility other than soaking up inspiration. I wouldn't be happy if I could define a typical day. I need the variation. I thought Kerry James Marshall's exhibit "Mastry" at The Met was one for the ages. Yevgeniya Baras, Caroline Wells Chandler, and Derrick Alexis Coard. I remember finding Richard Avedon's book of photography "In the American West" when I was 16. I think that book, along with a few others, are responsible for my becoming a painter. I was so moved by Avedon's work and remember feeling certain that there was nothing more powerful than the emotion artists could convey through images. I'm currently reading "What is Art?" by Leo Tolstoy. One of my professors at Wash U ended every email to me with the single word, persevere. Learning to listen to my own voice. I think our current state of art education is designed to teach students to distrust their intuition, their subconscious, anything that seems "irrational" or that we are unable to dissect and analyze rationally are mistrusted in the studio. In all my education, both undergrad and grad, what was respected and pushed on us was the hyper rationalization of art, the obsessive conceptualization of everything. This is fine to an extent, but when taken to an extreme it paralyzes students. It took me years of working alone in my studio to find my way back to my own voice, and then a few more years of re-learning how to trust it. Music isn't so important for me while I work. I enjoy it, but sometimes I shut it off and crave silence. A lot of people post about what they consume—food, cappuccinos, clothing, vacations, etc. I'm most interested in sharing what I create, and sharing what others create as well. I'm not very easily distracted. What are some of the things that feed your soul or get you through a tough day? Bike rides, talking to my brother on the phone, watering my plants, prayer and meditation. The group show I curated at Wayne State University (Say Yes) is up in Detroit, MI through July. I'm honored to be included in the group show, We Might Not Have a Planet Left Soon, curated by Adrianne Rubenstein, in Berlin through the end of June. My solo show Breathing on Land is up at Turn Gallery now through June 17th. I've just curated an installation with Caroline Wells Chandler for Wythe Hotel opening June 23rd, and it will be up through October. This July I'm headed back to Berlin for a residency with 68 Projects, which will be followed by a show in 2018. And lastly I have a solo opening at Marrow Gallery in San Francisco on October 14th. To find out more about Kimia and her work, check out her website.